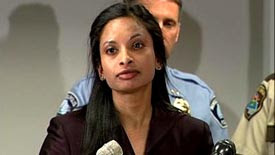 The U.S. Attorney for Minnesota is leaving her post to take a job with the Justice Department right here in our Nation's Capital. Rachel Paulose leaves her post amid a swirl of allegations that she mishandled confidential information and used racial slurs about an employee. Racial slurs and an inability to handle confidential information? She will fit right in at the Justice Department.